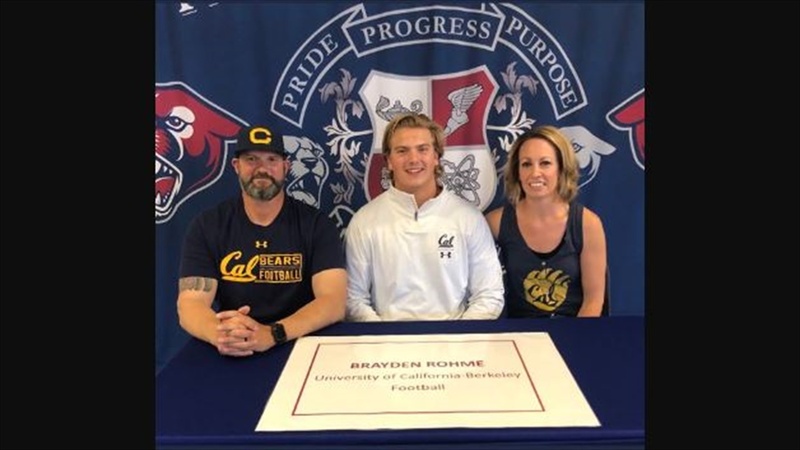 Hey Cal bear family, I’m Brayden Rohme from Chandler, Arizona. I played football at Perry High School. I started off as a defensive end, but eventually switched over to the offensive line . I primarily played offensive tackle but I have also played guard. My Recruiting first started off right after my junior season after picking up my first offer from UCF. Spring ball was when I started to blow up and receive offers from all around the country and got 19 offers in total. That summer, I narrowed down my list and planned to go on official visits to Iowa state, Cal, Oregon, and Nebraska. Yet after only going on visits to Iowa State and Cal, I knew I needed to look no farther. The visit to Cal sealed the deal for me. I felt like i already was a part of the family. I loved the city, The campus is beautiful and so are the facilities. The coaching staff has some of the best coaches in the country, especially coach Greatwood, i know he can mold me into a great linemen and improve my skill set tremendously. Coach Ragle is a down to earth, funny, and enthusiastic coach and an even better guy. I can’t wait to play for coach Wilcox and have him to coach me. Aside from football a Cal degree is something special. I have hopes to play in the NFL, but if it doesn’t work out, I know a degree from a prestigious school like Cal is almost as good, and maybe even better. I’m looking forward to hopefully winning some Pac 12 championships and playing with all the new teammates I will meet. Our 2019 class is already close so it will be fun to hang out with all of the guys. On the other hand I will miss all my friends in high-school and all the family I have in Arizona. But I know I have a new family waiting on me at Cal.